RAscal 1800 class of azimuth stern drive (ASD) tugs have been designed by Robert Allan. Image courtesy of Sanmar A.Ş. 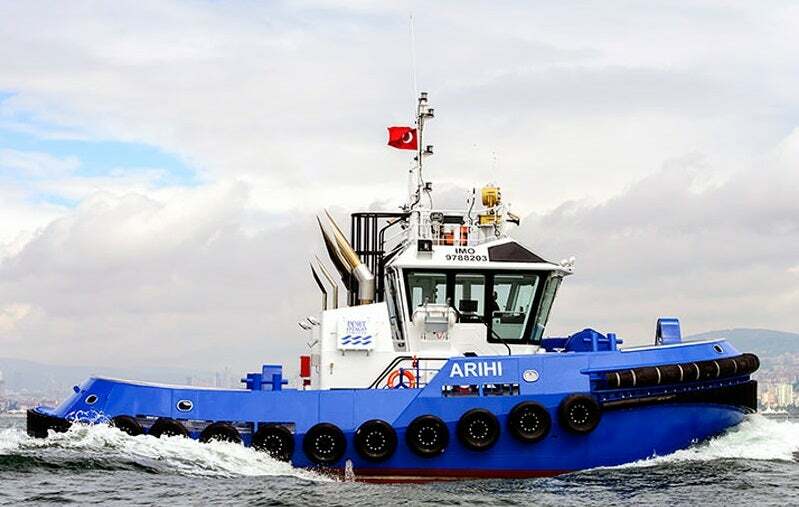 Arihi is the third RAscal 1800 class tugboat built by Sanmar Shipyards. Image courtesy of Sanmar A.Ş. Interior view of the wheelhouse on a RAscal 1800 class tugboat. Image courtesy of Sanmar A.Ş. The RAscal 1800 class tugboat features two double cabins. Image courtesy of Sanmar A.Ş. RAscal 1800 is a series of azimuth stern drive (ASD) tugs designed by Robert Allan in collaboration with Turkish shipbuilder, Sanmar Shipyard. The tugboats offer superior seakeeping, manoeuvrability and stability in all modes of operation. The latest tugboat in RAscal 1800 class, named Arihi, was delivered to Port Otago Limited (POL) in June 2016. The vessel has a bollard pull of 30t. The RAscal 1800 class tugs incorporate all-welded steel hull. The omnidirectional vessels are fitted with a single row of 500mm x 250mm cylindrical fender along with vertical W-block fenders at the bow section. "The latest tugboat in RAscal 1800 class, named Arihi, was delivered to Port Otago Limited (POL) in June 2016." The sides and rear section of the hull are protected with 300mm D type fendering. The wheelhouse accommodates a forward control station, which offers optimum visibility to the fore and aft deck working areas. The class tugs feature suitable arrangement to support the towing operations on forward and aft directions. The engines and essential equipment are resiliently mounted to reduce noise levels according to the requirements of Flag Authorities. The vessels are also equipped with a manually-operated water/foam monitor and a ME PTO-driven fi-fi pump having a capacity of 600m³/h. The boats can be optionally installed with a fuel separator, a vacuum toilet, a deck crane, heated windows and wipers, a fresh water ultraviolet sanitiser, and heated floors for wet spaces. The tugboat has an overall length of 18.7m, moulded beam of 9.2m, moulded depth of 3.5m, and maximum draft of 3.7m. The tugboats are installed with electrically-driven DMT TW-E100kN fore winch with a fully variable speed up to 30m a minute at 3t pull. The Hawser drum capacity of the winch is 100m of 40mm nylon rope in four layers. The remote auto-release system ensures a slack rope speed of 30m a minute. The aft deck houses Data Hidrolic DTH 30-60P pneumatic auto-release tow hook to enable stern towing. The ASD tugboat can carry 34m³ of fuel oil, 6m³ of fresh water, 1.4m³ of grey water, 1.4m³ of black water and 3.4m³ of oily water. The navigation and communication systems aboard the vessel include a radar, global positioning system (GPS), an echo sounder, an automatic identification system (AIS), an autopilot, a bridge navigational watch alarm system (BNWAS), a general alarm, an intercom, SP telephone, engine telegraph, VHF radios, and global maritime distress and safety system A2 (GMDSS A2). The tugboat accommodates four persons in two double cabins located below deck. The cabins are provided with water closet and shower. The vessel also offers a galley and mess for crew. The floor area is covered with IMO-approved teak imitating covering, whereas all accommodation spaces are equipped with heating, ventilation and air conditioning (HVAC) system and optional clod/hot climate packages. The accommodation facilities offer very high level of comfort and safety to meet the requirements of flag authorities including Germany, Italy and UK. The tugs are powered by two Caterpillar C32 main engines, which develop a power output of 970kW each at 1,800rpm. The engines drive stern-mounted Veth VZ-900 azimuth thrusters through Vulkan carbon composite shafts. The thrusters house nozzles and 1,700mm five-bladed propellers. The shipboard power is supplied by two 86ekW Caterpillar C4 auxiliary generator sets. The propulsion system provides a forward speed of 12k and a rearward speed of 11k. Nor Crane & Winch Group is one of the market leaders within pulling and lifting equipment for the offshore and marine market. Nor Crane & Winch is a specialist provider for electrical and hydraulic deck machinery for the offshore and marine industry.